I'm no stranger to being embarrassed by my antics. Normally they make for funny stories. If I can make someone laugh, even at my expense....why not? 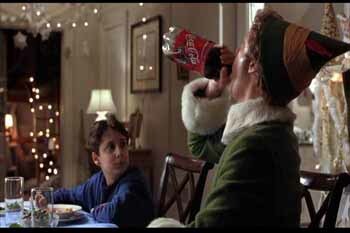 "Whoa buddy...do not take this to the streets." No, I'm not talking about the time I put too many items in one of my sweat pants pockets that led me to pants myself while walking up my driveway. No it was not the two times I burped super loud during student career counseling appointments. It WAS my recent DMV experience. As many of you know I previously had a horrid driver's license picture. 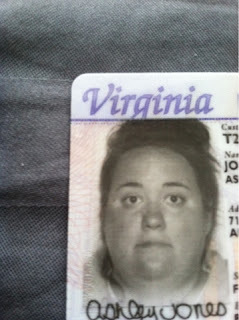 It's a VA state law that you can't smile in your license picture, and your picture is now black and white. "I swear I didn't murder a family." Then I lost this gem. So I went to the DMV to just order a new one. I wasn't prepared for taking a new picture in the slightest. Honestly, I looked fairly homeless. While I waited to renew I remained calm. Two Girls? Two Guys? 1 Girl & 1 Guy? The answer: One of each. "Hey I lost my license, just need a new one." "OK, come with me to take a new picture." I asked if he could just use my old picture, and he literally acted like he didn't hear me. So I dragged my feet like a 12 year old boy stuck shopping with his mom while she looked for bras. and then after laughing at the result told me it would be ready in 7-10 days. He turned the computer to show me but since I didn't have my glasses on I saw a blurry figure that didn't look half bad. 7-10 days later it arrived. 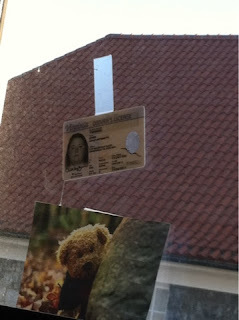 In the meantime my original driver's license was found in Sara's car. 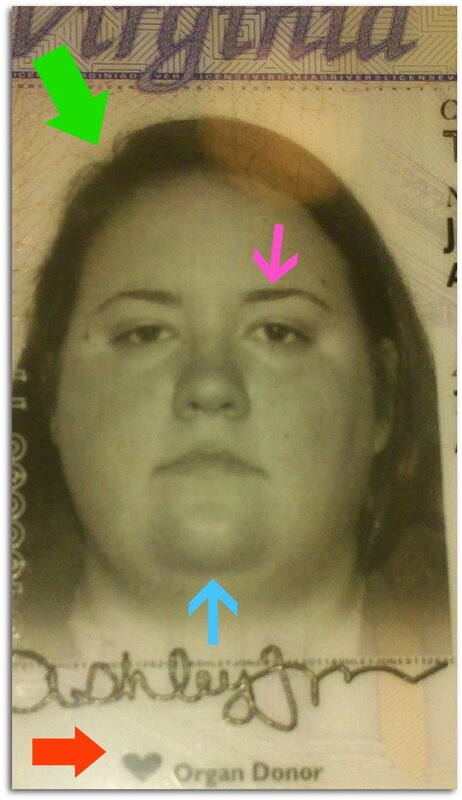 I mean two horrid driver's license pictures couldn't happen to one person. I'm so hesitant to post this because it is so horrible. But secrets are no fun. I was trying to rectify the lazy eye situation, and boy did it back fire. My grandma told me it looks like I got caught stabbing someone. Barb said it was a mugshot. Tim asked if I did it on purpose, because clearly no picture could be taken that looked that horrid on purpose. I assured him that no it was in fact for realsies. I don't even know what else to say about it. However, I do know that when I get caught for hiding in Adam Levine's laundry basket and am on the run from the law, this is the face that will be on CNN. I too am embarrassed when I go out and have to show my ID.